Tarbert (Loch Fyne) is 50 miles south of Oban. A regular train service operates between Gourock and Glasgow. From Gourock you can get the ferry which plies back and forth to Dunoon on the Cowal Peninsula. You have a choice of Caledonian Macbrayne or Western Ferries on this route. The CalMac ferry terminal is adjacent to the train station. The Western Ferries terminal is slightly further on - at McInroy's Point. No vehicle reservations are required on either ferry. 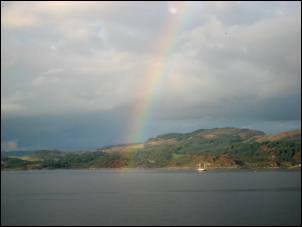 From Cowal you can then get the Calmac ferry from Portavadie across Loch Fyne to Tarbert on the Kintyre peninsula. From Kintyre, you can take CalMac ferries from Kennacraig to Islay, from Claonaig to Arran, from Tayinloan to Gigha. From late April to September Caledonian Macbrayne operates a summer ferry service from Ardrossan (Ayrshire) to Campbeltown. West Coast Motors is the local bus company. Visit their web site for all the timetables. Citylink coach services operates services between Glasgow, Oban, Inveraray, Tarbert, Campbeltown and various places in between. British Airways operates flights between Glasgow and Campbeltown. Image reproduced with kind permission of Ordnance Survey and Ordnance Survey of Northern Ireland. 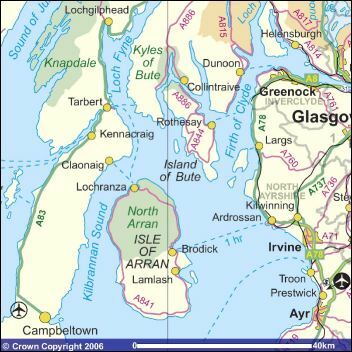 Free tourist map of Kintyre (downloadable PDF courtesy of The Oban Times). This is a busy little fishing harbour which is conveniently situated between Loch Tarbert and Loch Fyne, this is a ideal base for a touring holiday of Argyll and Kintyre. The Calmac ferry from here plies back and forth to Portavadie which has a new marina complex on the Cowal Peninsula. 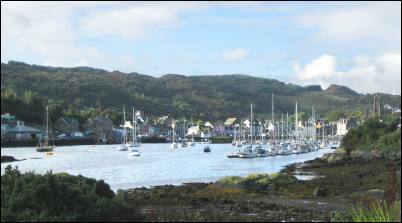 Amenities in Tarbert include B&Bs, hotels with restaurants, general stores, post office, bank. 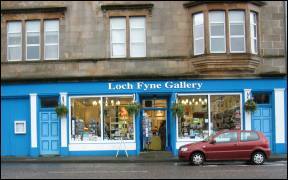 The Loch Fyne Gallery near the tourist office on the main street is a great place for books, cards, prints, gifts, etc. Good places to eat include The Anchor Hotel, the Tarbert Hotel and The Victoria which are all situated around the inner harbour and many participate in the annual Tarbert Seafood Festival. Cafebarge is a Dutch barge permanently moored in the harbour - it serves meals, coffee and wines/beers. Vegetarian food and seafood are specialities. Tel: 07949 723128. 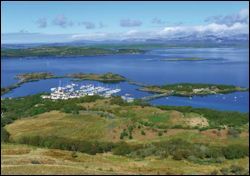 You will see plenty of fishing boats and also a lot of yachts, particularly when races are taking place such as the Scottish Sailing Series when Tarbert is full to capacity. Up on the hill you may spot the ruins of Tarbert Castle which date from the 15th century. 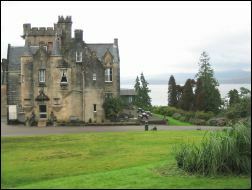 The original castle has links with King Robert the Bruce. The 18th century parish church topped by a crown and lantern is also worth a look. Just outside of the town to the south is the heritage centre of An Tairbeart (tel: 01880 821 212) where you will also find a coffee shop, crafts and gallery (open for the summer, closed in winter). Continuing south out of Tarbert you will come to Kennacraig which is the ferry terminal for the Isle of Islay. There is a ferry office, toilets and car park. Day trips are possible depending on the ferry timetables. Near here you can take the small B8001 road across country to Claonaig which is the ferry terminal for the Isle of Arran. 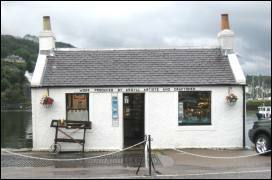 Please note there is no ferry office at Claonaig (only toilets) but you can easily buy your ticket on the ferry when it arrives. Along the coast from Claonaig is Skipness Castle (a ruin in the care of Historic Environment Scotland) which is worth the detour if you have time. The nearby chapel with its ancient carved tombstones can also be visited. 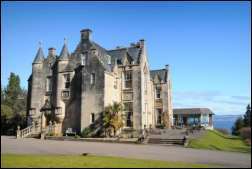 Two miles outside Tarbert to the north is Stonefield Castle Hotel. You don't have to stay there to enjoy a meal in the bar or restaurant, or explore the gardens which go down to the shores of Loch Fyne. Built in 1837, it is set in 60 acres of woodland gardens with a fine collection of Himalayan Rhododendrons which are free to explore. 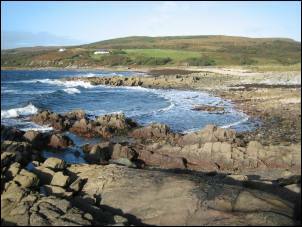 For keen walkers, The Kintyre Way stretches for just over 100 miles from Tarbert to Dunaverty Bay with various diversions possible. You will see blue posts which point you in the right direction. A free leaflet is available - click here for details. 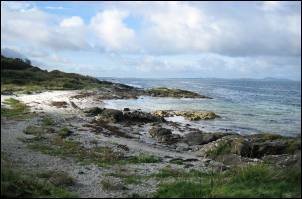 Ronachan Point where you can often spot seals and see across the sea to the hills of the Isle of Jura and Gigha. Tayinloan is the Calmac ferry point for the Isle of Gigha - well worth a day trip. The island has various historic sites to visit, beautiful views, hotel, general store and the well known Achamore Gardens. These 50 acres of beautiful woodland gardens including exotic plants and trees, walled garden and greenhouses are open all year. Tel: 01583 505254. Established in 1944 by Sir James Horlick, then owner of the island who was a keen gardener and plantsman, with a particular interest in rhododendrons, azaleas and camellias. 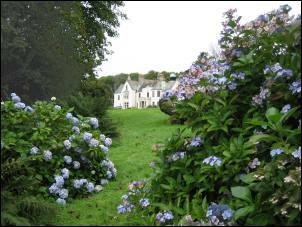 The gardens are now owned and managed by the Isle of Gigha Heritage Trust on behalf of the islanders. The historic Royal Burgh of Campbeltown is a large town with a population of over 5,500 and many shops and facilities including an airport (thanks to its wartime past). 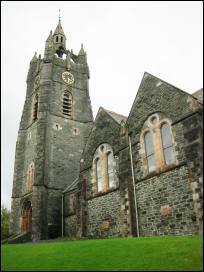 Visitor attractions include the heritage centre in a church, museum & library, leisure centre with swimming pool, tourist information office, the famous art nouveau Wee Picture House, Linda McCartney�s Memorial Garden and the Campbeltown Cross. Once known as the Whisky Capital of the World thanks to its 34 distilleries, today it has just a few left including Springbank (tel: 01586 552085 for tours). Boat trips operate to Davaar Island which has a cave painting of the Crucifixion. Machrihanish - huge beach and famous golf course. Mull of Kintyre - made famous by Paul McCartney's song. Saddell Abbey - historic ruins with carved grave slabs on the east coast of Kintyre. Torrisdale Castle - organic tannery and crafty sheep shop open to visitors. 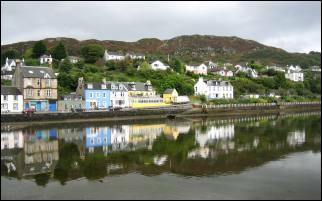 Carradale - pretty village with harbour, golf course, heritage centre with exhibitions, tearoom and shop. between Loch Fyne and the Mull of Kintyre. Ideal for ferries to Islay and Arran. Kilmartin 20 miles, Inveraray 40 miles. 1 hour south of Oban. Sea views. No smoking. Pets welcome. Family home with friendly welcome. and 1 single with private bathroom. B&B prices £40 per person (2 sharing). B&B in single room £50. £35 per person (2 sharing) / £45 single room. Open from April to September 2019. Built in 1837 on the shores of Loch Fyne. 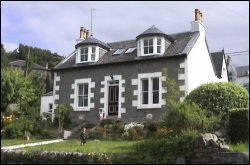 2 miles from the picturesque fishing village of Tarbert. with a fine collection of Himalayan Rhododendrons. also the islands of Gigha, Islay, Arran, Bute. Recommended by Conde Nast Johansens. Award-winning restaurant (AA Rosette) with views over the gardens and Loch Fyne. Wood panelled lounge bar. Room service available. with TV, telephone, tea/coffee, hairdryer. B&B prices from £40 per person per night. Overlooking the sea with views across to the Isle of Arran. Wood panelled restaurant for candlelit dinners. 2 bars, large conservatory, decking area and garden. tea and coffee trays with home baking. Room only from £40 per person. A choice of 3 Scandinavian log lodges set on the Island of Buidhe. Ideal for wildlife watching, walking and water pursuits. (shops, pub, restaurant, watersports and marina). Kilmartin 10 miles. Lochgilphead 17 miles. 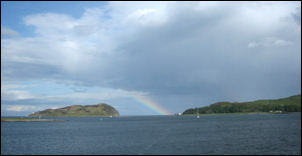 Oban 22 miles. bathroom with double whirlpool bath. Ideal for romantic breaks and honeymoons. both with ensuite bath with overhead shower. Outdoor hot tub. Patio and lawn. TV, DVD, CD, microwave, dishwasher & washing machine. Designer fabrics and leather suites. Personally managed by the owners. includes, bed linen and electricity. Short breaks available. Online booking. No smoking. Pets welcome (extra charge). Wide choice of self catering properties ranging from 1 to 7 bedrooms. Cottages, log cabins, apartments, large houses, etc. Lochgilphead, Crinan, Dunoon, Mull of Kintyre. Web site with virtual tours and instant online booking. Short breaks and late deals often available. Carradale Cottage is near the golf course in Carradale, on the east side of the Kintyre peninsula. 25 miles south of Tarbert. Sleeps up to 6 people with 2 bedrooms plus a sofa-bed in the living room. One of the great Pevensey Guides written by Norman S. Newton. Lovely colour guide book covering the local heritage and culture of the area, nature, the landscape, place names, history, places to visit, etc. 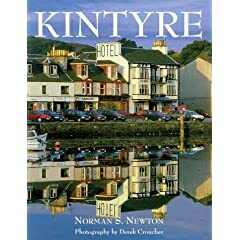 Even if you don't get chance to buy it before you go, you will certainly want a copy for a souvenir when you have visited Kintyre! Also includes Gigha. Map with 8 easy to follow walks. Published by Footprint. Part of the Exploring Scotland's Heritage series and is a very useful guide to these parts of the country. Produced by well-known archaeology experts Anna & Graham Ritchie. Paperback edition. 156 pages.